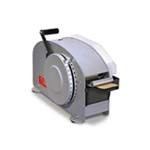 Manual gummed tape dispensers are a great way to effectively secure packages and cartons. Manual gummed tape dispensers are ideal for low to moderate volume packages, since they offer the strength, seal integrity, attractive, and professional closures that are needed in the packaging industry. These tape machines are very versatile since they do not require electrical cords, and are able to successfully perform in the harshest of environments for many years.